The second instalment in the chaos walking series. This book tells the story of hope in the face of terrible odds. As well as asking you can human beings ever be peaceful or is it just one big fight for power? After Todd and Viola make it to Haven (the book’s fictitious city),to find that Mayor Prentiss has arrived ahead of them as well as realising that now Mayor Prentiss has now become president Prentiss things can only get worse. After a week into this new reign of power all women have been separated from the men and dragged to various prisons across the city. Todd like all men now must work and has been placed with Davy Prentiss as his partner. Viola has been taken away from Todd and he has no idea where she is. Except when bombs start hitting soldiers and civilians in broad daylight and the mayor is pointing his finger at a mysterious all woman terrorist organisation seeking to overthrow the president. 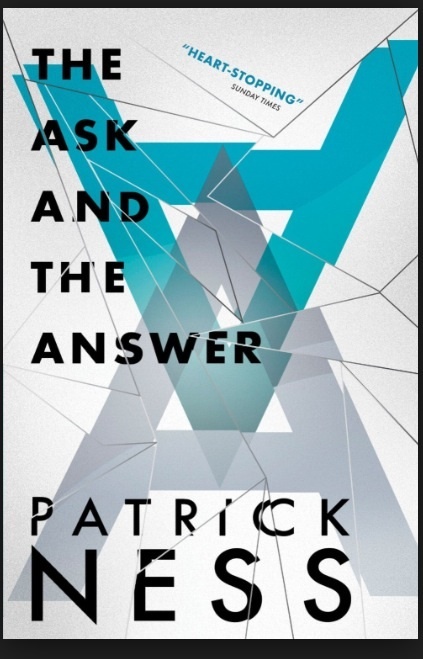 Word quickly spreads that Viola may be involved Todd begins to ask himself who the real bad guy really is..
Patrick Ness has out done himself yet again the amount of emotion that he gives to every single one of his characters is absolutely mind-blowing. Previous Previous post: Lockwood and Co.